Ray Henness concedes his $26 outsider Chiquita Lass (pictured with Ray Henness at the Ready 2 Race Auctions) faces a daunting task in Thursday night’s lucrative Group 2 Launching Pad Final (515m) at Sandown Park. But that’s certainly not to say Heathcote-based Henness doesn’t have a sizeable opinion of Chiquita Lass. Given a slightly longer and better preparation, he’s adamant his lightly-raced Ready 2 Race Auction graduate would’ve given the Launching Pad’s $150,000 winner’s purse an almighty shake. “If I had another month up my sleeve she would have been very, very competitive,” Henness said. “It’s been a bit of a rush job because of a few little niggles that have held her back. Chiquita Lass first came under the spotlight last November at Bendigo’s Ready 2 Race Auction, when she was the top-priced lot, with Henness parting with $20,000 on behalf of Con Dimopoulos. In winning two of her first seven starts, the daughter of Kinloch Brae and Halina has already banked a tick under $9000 in prizemoney and she would recoup her purchase price in full with third place in Thursday’s rich Launching Pad decider. “I liked her early pace and her breeding but she actually fell in the (Ready 2 Race) final and they were going to pull her out,” Henness explained. “But I told them I’d go to $20,000 and we ended up buying her. “She basically came on season when we bought her and came into milk, so I had to let that settle down before pushing her too much. After finishing unplaced behind the classy Time To Talk in Shepparton’s Matchmaker Classic Final in early March, Chiquita Lass had a month off, before stepping past 500m for the first time in the Launching Pad heats. Sent out an $18.70 roughie, Chiquita Lass ran a meritorious second to Curt Lee, beaten only two lengths in 29.50s, clocking 29.64s in defeat. She then booked a berth in the final when again finishing runner-up to sensational 29.17s semi winner Lucy’s Milo, this time beaten eight lengths. WATCH: Chiquita Lass (box 2) finish second to Lucy’s Milo (box two) in a semi final of the Group 2 Launching Pad. 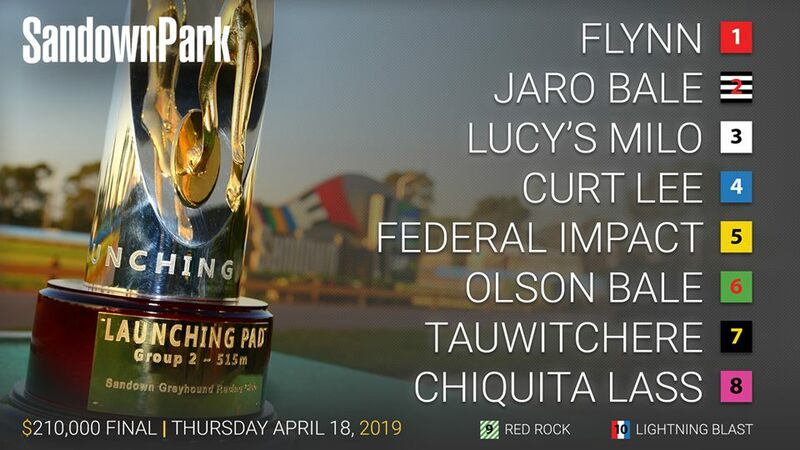 While she had the benefit of drawing one and two in her heat and semi-final respectively, Chiquita Lass will have to contend with box eight and potential top-liners in Flynn (box 1 – $2.40 favourite), Lucy’s Milo (box 3 – $2.70) and Curt Lee (box 4 – $6) on Thursday night. “She’s a very rough chance,” Henness laughed. “I was hoping she would draw inside again, which would have given her a chance of sneaking a place. But it’s going to be very tough from out there. There are some hot dogs in the race.